The University of California Los Angeles (UCLA) is the proud owner of the “Duke of Alcantara” Stradivarius violin. This “Golden Period Strad” is known for is uncanny power and pure resonance and was made in 1732. It is one of the most highly regarded and sought after violins as it is thought to have been owned by Napolean Bonaparte. UCLA’s history with its Stradivarius violin has been quite adventurous. It was originally donated to the university by Genevieve Vedder in the early 1960s before it went missing in 1967. Nobody really knows how “the Duke” went missing. Some believe it was left accidentally by the side of a road by, while others believe it was stolen from the university. Luckily, in 1994 the instrument came into the possession of Teresa Salvato, who apparently received the violin through a divorce settlement. Once UCLA discovered that their violin was in her possession, they sued Salvato to regain ownership of the violin. Surprisingly, after all of UCLA’s efforts to bring home their beloved Stradivarius violin, the UCLA music department attempted to auction off “the Duke” when their music program faced significant budget cuts in the 1980s. But after a year on the market, the violin didn’t sell and the university was essentially forced to keep it. It was then that UCLA professor Antonio Lysy stepped in to save the “Duke of Alcantara.” He lobbied to keep the violin with the music department and proposed to showcase the instrument through student concerts Accordint to Lysy, the Duke’s mission was to inspire others to donate and get involved with the school. Eventually, the university community came to see UCLA’s Stradivarius violin as more than just a historical artifact. It became a symbol of musical greatness and now the ultimate goal of every UCLA student musician is to play this amazing instrument at a university concert. Today, the Duke of Alcantara is showcased at concerts several times per year. Who gets the privilege of playing with the Duke is determined by a rigorous audition process. 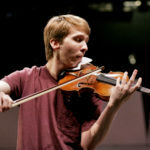 In the video below, Luke Santonastaso, a third-year violin performance student, got the opportunity of a lifetime to play the Stradivarius violin with the UCLA Philharmonia in 2011. After watching the video, we’re sure that you would agree that the power, grace and brilliance of this ancient instrument elevates and soars above all the performers. You get to hear history and feel the soul of the Duke of Alcantara – a truly one-of-a kind violin.